On Friday, February 17, Nicolas Cage gets a do-over with Ghost Rider Spirit of Vengeance, his second opportunity to play Marvel Comics’ motorcyle-riding daredevil Johnny Blaze and his devilish alter-ego, the Ghost Rider. Taking place a number of years after the Mark Steven Johnson Ghost Rider, Johnny Blaze is now riding across Eastern Europe, trying to deal with his demonic possession, when he’s dragged into a rescue mission for a young boy named Danny whose mother Nadja is trying to protect him from the Devil (in the guise of Ciaran Hinds) and his mercenary henchman Carrigan. Helping them out is the bike-riding monk Moreau, played by Idris Elba in his third comic book role following The Losers and Heimdall in last year’s Thor. ComingSoon.net/SuperHeroHype attended the New York junket for the movie last week and had a chance to speak with both Cage and Elba about their roles in the movie. We’ve spoken with Nicolas Cage a couple times now about making this movie, and this time, we talked to the actor about how he wanted to approach Johnny Blaze differently in this sequel and actually playing the Ghost Rider this time. (Yes, you heard him right. He painted his face on set because he didn’t want to look ridiculous.) He also talked about what his influence was for the Ghost Rider’s distinctive mannerisms as well as how there isn’t as much CG in this movie as some might think. Elba is coming off his recent Golden Globe win for his reprisal of “Luther” in the hit BBC series, and he has two big science fiction movies coming up with Ridley Scott’s Prometheus and Guillermo del Toro’s Pacific Rim, which he’s currently shooting. We spoke with Elba about playing a character not in the comics, coming up with Moreau’s mannerisms, riding a motorcycle and playing opposite Cage’s “mega-acting.” He also talked about how he’s been drawn to so many big genre films in recent years. 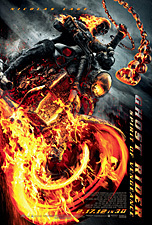 Ghost Rider Spirit of Vengeance opens nationwide on Friday, February 17 in 3D and 2D theaters. You can watch our interview with the film’s directors Mark Neveldine and Brian Taylor here.